I had an email from Alli and Sean this week updating me on Tonka. 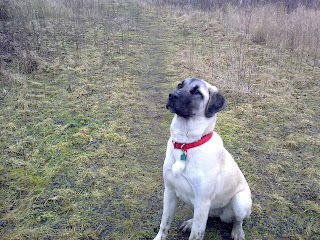 I am told that Tonka remains a great dog. Alli tells me he is a far better companion than any dog she has ever had previously and he has already matured into a true gentleman. He has also become an excellent running partner and particularly enjoys running as fast as we can through the trails of a nearby park. Alli used to 'jog' but Tonka enjoys a faster pace. His personality is calm and almost human. Alli and Sean have had the same issues as Rachel and Stuart - the car. They have had to buy a different car in October as Tonka did not fit in our sedan alone (much less with the other dogs). 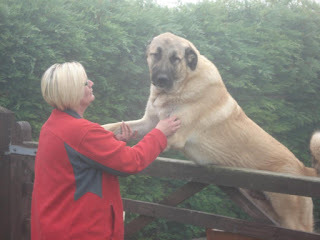 What a big dog you are Cesur!! I like this photo of Rachel and Cesur. 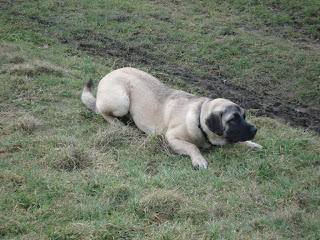 There is no doubt he is a big dog but he is being a little crafty when you look at the next photo!! I was looking again through the photos and thought these two were lovely. I particularly like the one of Fern. She has a beautiful head on her (taking afgter Ugarit). This photo below of Kai show him looking more and more like his dad. 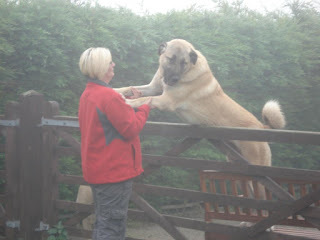 Here are a few photos that I have taken from Stuart and Rachel's PhotoBucket album of Fern and Kai. They are in the March folder so they are very recent. The top photo is of Kai who is now 8.5 months and the second photo is of Fern who is 14.5 months. Looking lovely and Kai is looking very like dad and my own little Bal. Bernie and Nick sent me these photos of Charlie in February so apologies that it has taken me so long to get them on the blog page. Bernie says "She may be a little lady, but she's also a little madam! 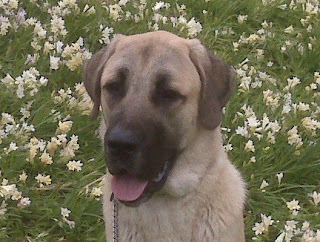 She has some very typical traits of the Anatolian - she loves digging huge holes, and we have some very fine examples in the garden. (how come you didn't have any in your garden?). She also has selective hearing, and if she's distracted by something (like a rabbit) she totally ignores us when we call her and refuses to come back. This must be the 'independent' streak that Anatolians have! She's still curious about everything, especially those things that she can't get to, like... our cat (who won't let Charlie within five feet of her), and birds in trees; she can't get near them and it drives her mad! She still gets up onto the bay window and watches village life pass by. She absolutely loves people, and when we take her for a walk, she lunges at any human that passes within a couple of feet; she just wants to play with them, but some people aren't too keen on having a big dog trying to jump up and lick them, but others think it's great. This can make going for a walk a bit of a challenge! She does attract a fair bit of attention when we're out because she's so gorgeous looking. 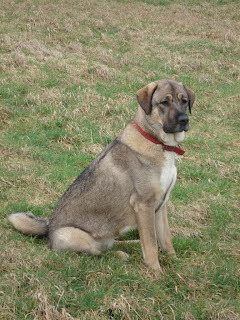 And she does love the attention She's still very bouncy and puppyish and finding lots of things new and exciting. 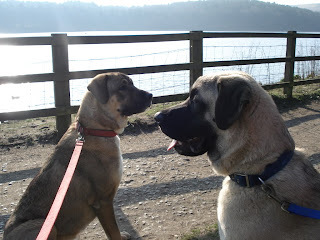 We're taking her to training classes every week, and she really loves meeting the other dogs - she's very sociable. She can do everything they ask in the classes, she's very clever. But away from the classes she'll only do things if she feels like it, and it's as if she's indulging us by doing what we ask of her!!! She's still very affectionate and loves being petted and cuddled, which is fine by me. 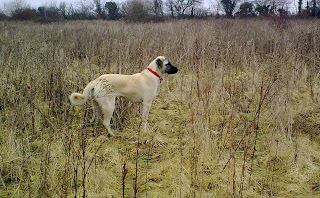 She's getting very big now and when she stands on her hind legs she's almost as tall as I am". These are the sort of emails that John and I like getting - they give us a huge amount of pleasure.